This blog is part of our Inspired Ethonomics series. It’s co-authored by Second Nature President Anthony Cortese and Senior Fellow Georges Dyer. The Copenhagen negotiations in December failed to deliver a concrete, binding international treaty on climate disruption. The Senate is at an impasse on creating meaningful federal legislation that can sufficiently address the climate challenge while rebuilding a better economy. Some in big business are spending big money to revitalize climate confusion despite the consensus in the scientific community, and it’s working. Many claim that the dearth in leadership is too great to make the changes necessary to avoid runaway climate disruption. But leadership happens at all levels within organizations and within communities. Usually it’s the leadership at the lower levels or smaller scale that paves the way for large-scale change. Process innovations often come from someone on the frontline, familiar with the details, recognizing a better way to do things (and having the voice and support to share it). Virtually all federal legislation is preceded by similar action at the state level. In the case of eliminating greenhouse gas emissions, colleges and universities have formed the tip of the spear, forging ahead towards climate neutrality. Through the American College & University Presidents’ Climate Commitment (ACUPCC) network, 675 institutions have come together pledging to take immediate actions, create longer-term plans, and publicly report their progress toward net-zero emissions. In one sense, the ACUPCC is a broad grassroots-type of initiative, with institutions of all types from all 50 states and Washington, DC, representing more than 5.7 million students. And it is setting precedent for the larger communities (cities, states, the nation, and the world) that need to move toward climate neutrality with great urgency. On campuses, students have been instrumental in moving climate disruption and sustainability from the realm of fringe groups to a strategic imperative for presidents and trustees. At Middlebury College, DePauw University, and the University of Minnesota, students were instrumental in making the case for signing the ACUPCC to the administration. Students and youth leaders are also collaborating between campuses and across the country to create a compelling vision and a clear plan for the future they are inheriting. Earlier this month, students from twelve Maine colleges and universities including Bowdoin College, Colby College, and College of the Atlantic met at Unity College for a Sustainability Training Institute, where they shared their experience with greenhouse gas inventories, renewable energy, and community projects. From March 15th-28th, the Energy Action Coalition – a network of dozens of organizations leveraging their collective power to create a clean energy future – is coordinating two weeks of action, during which thousands of young people will take part in “Define Our Decade.” They will articulate their vision for 2020 and identify concrete steps for realizing it. This type of broad-based, grassroots leadership is essential, but those in top leadership positions are also necessary to fully engage the entire institution when addressing a challenge as systemic and all encompassing as sustainability. In this sense, the ACUPCC is a “grasstops” initiative – led by a Steering Committee of twenty-two presidents from all types of schools from all across the country, including Arizona State University, Houston Community College, and Furman University. Last year, a group of ACUPCC presidents created a resource for all college and university presidents called Leading Profound Change. They drew on research from the academic and business sectors to reinforce the importance of active, sustained involvement in the change process and included examples of how the presidents of institutions like Cornell University, the University of Pennsylvania, Tulane University and the University of New Hampshire are approaching this leadership challenge. They discuss successful strategies to communicate and foster collaboration, concrete steps to develop clear goals and metrics for accountability, the “Five Disciplines” of a learning organization, and strategies to address limiting factors. The big question – the only question – of this century is: will we be able to create a sustainable society before it is too late, before social systems (including economies) and ecological systems collapse on a planetary scale? The only answer is yes – if there are enough leaders in time, and if higher education prepares those leaders for the challenge. 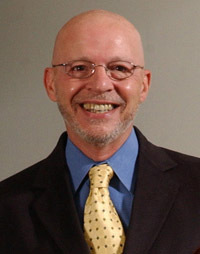 Anthony D. Cortese is the Founder and President of Second Nature, a national nonprofit organization working to accelerate movement toward a sustainable future by serving and supporting senior college and university leaders in making healthy, just, and sustainable living the foundation of all learning and practice in higher education. Second Nature is the lead supporting organization and Dr. Cortese is the Organizer of the American College and University Presidents’ Climate Commitment, which more than 665 schools have joined as they pursue climate neutrality in their campus operations and educate their students to address climate change upon graduation. Second Nature also runs the Higher Education Associations in Sustainability Consortium as well as the Advancing Green Building in Higher Education initiative, which helps under-resourced and minority-serving colleges and universities to build and renovate sustainably on campus. Dr. Cortese has spent the past four decades working for sustainability and environmental protection, including his time as Commissioner of the Massachusetts Department of Environmental Protection as a Dean at Tufts University. 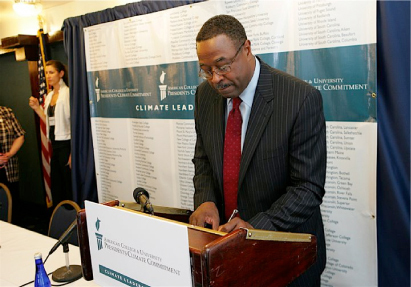 Georges Dyer is a Senior Fellow at Second Nature, where he focuses on the American College & University Presidents’ Climate Commitment (ACUPCC) and other leadership initiatives. He holds a Master’s in Strategic Leadership towards Sustainability from Blekinge Institute of Technology in Karlskrona, Sweden, and a BA from Dartmouth College.